Beautiful and Terrible Things, (Louisville: Westminster John Knox Press, in progress – 2020). What started over twenty years ago as an academic study became personal when our son Mack died unexpectedly of a blood infection on New Year’s Eve 2012. In this work, bringing together scholarship and experience, I consider what the Bible has to say about suffering and grace while reflecting upon my own loss and grief. What is revealed is that rather than an image of God managing every event and action in our lives, the biblical account describes the very real world in which we all live, a world full of hardship and calamity that often comes unbidden and unmerited. Yet it is also a world into which God lovingly intrudes, to bring comfort, peace, and grace. As importantly, the Bible also provides license to lament, to grieve, and to protest the injustice we experience. My academic work has largely focused upon ancient rabbinic interpretations of the Bible. (Although in articles I also examined issues of interpretation in the New Testament and the reception of Jesus in the Talmud.) The two academic books that I have published are critical commentaries on the Aramaic versions (Targum) of the Books of Lamentations and Ruth respectively. Much more detail about Targumic literature and these specific works can be found at Targuman.org. The Rabbinic Targum of Lamentations: Vindicating God, Studies in the Aramaic Interpretation of Scripture, vol. 3, (Leiden: E. J. Brill, 2003). In Targum Lamentations, c. 7-8th century CE in its current state, we find that the biblical book has been transformed through various exegetical techniques into a rabbinic program for the synagogue. The first section examines how the targumist demonstrated that Israel herself is responsible for the destruction of Jerusalem and thus absolves God of all culpability. Yet the targumist continues to assert that God is the ultimate source of all history. The second section examines how the targumist depicts God as orchestrating events through his action and abstention. Finally, the targum argues that reconciliation with God can only come about through repentance and rabbinic worship. A new translation and a transcription of TgLam from Codex Urbinas Hebr. 1 is included. 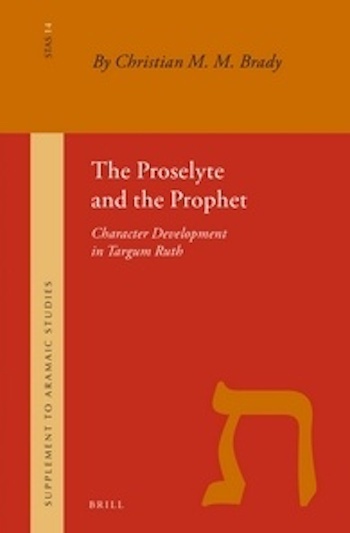 The Proselyte and the Prophet: Character Development in Targum Ruth in Supplements to Aramaic Studies, vol. 14, (Leiden: E. J. Brill, 2016). This work is an exegetical study of Targum Ruth (also c. 7-8th century CE) with a focus upon the transformation of the biblical characters into exemplars of rabbinic piety. Ruth becomes the ideal proselyte while Boaz is presented as a judge, a scholar of the Law, and a prophet. Brady demonstrates that the Targumist follows standard Targumic practice, rendering each Hebrew word of the biblical text into Aramaic, while making additions that further his agenda of presenting Ruth as a rabbinic model to be emulated. In addition to the character analysis there is a transcription of the manuscript Valmadonna 1, a new translation into English, and a verse-by-verse commentary of Targum Ruth.